Grandpa C found out that I know all about his blog back in April when I left my first guest post. But I haven't blabbed to anyone. It's good to have something I can hold over the old guy... just in case. Just in case of what, I'm not sure. And, speaking of not sure, I'm not exactly sure about what's been going on around here the last couple of days. Mommy got some balloons from the store -- they're huge! -- and they stay up in the air all by themselves. One is giant number 1 -- I know this because I watch Sesame Street videos these days on everybody's phone or on Grandma's iPad. I don't know why it's Grandma's iPad. Grandpa always seems to have it. He thinks he can play word games when I'm in the room, but I soon put him straight. Anyway, the other balloon is a giant cupcake. I didn't know about cupcakes before but Mommy baked up a whole bunch of them, and I got to eat some of them. They're pretty good. She puts frosting on some of them, too. That's even better -- but every time I eat one with frosting, someone takes my picture. The last couple of days my picture has been taken so many times; I'm getting pretty concerned about it. Has my appearance suddenly changed? I know my hair has grown in some -- Mommy puts bows on me now -- but that's been pretty gradual and doesn't explain all this sudden activity. And I've been standing more, lately, too. Crawling is still faster, but when I stand I can get at anything they leave on the coffee table in the den -- food, glasses, phones. You'd think they'd discourage this -- they're so picky about my picking up their glasses, for example -- but they cheer me on. Last weekend Mommy and Daddy got me shoes. Grandma and Grandpa and Mommy and Daddy all wear shoes when they go out of the house. At night, Grandpa will come home and take his shoes off just as soon as he can. They must affect his hearing because when he takes them off he says something about dogs barking. They also keep you awake: Grandma takes her shoes off and promptly falls asleep. But now they want me to wear shoes -- and in the house, too. But this standing and edging along the furniture has been pretty gradual. The shoes are recent, but, like I said, that was the weekend. And all the pictures and all this other strange stuff started towards the end of the week. My first guess was that it had something to do with teeth. I have got to tell you, growing these things are murder. I know grownups walk around with whole mouths full of these things, but I can't imagine how you can stand the pain of getting them all. It's soured my disposition, let me tell you. It's given me fevers and I wake up at all hours and Mommy and Daddy say some of my diapers are terrible. Growing teeth hasn't hurt my appetite, though, and I can eat bread now. Grandpa says I beg for table scraps worse than any puppy he's ever seen. He tells me that he doesn't try to take any of the food off my plate when I eat -- so why should I be trying to take food off his plate? Grandpas are so silly, aren't they? Have you seen the mush Mommy and Daddy try and palm off on me? Anyway, after Mommy got me those two giant balloons, Daddy came home with an Elmo balloon, too. I'm a big Elmo fan, which Grandpa says is kind of creepy. I don't think I want to know what he's getting at. I'd rather watch Elmo sing the "Elmo Song" with Big Bird and Snuff -- Snufflup -- Snuffleupagus -- you know, that's a pretty big word for a little kid to write -- and I like Elmo and the Ducks and Elmo singing with Adam Sandler, too. Yesterday, Abuela came over and she brought some more balloons. No more Elmo balloons though. Grandpa came home last night and said he's figured out that we're the cause of the helium shortage. He's always saying strange things like that. After thinking about it, I couldn't figure any connection between this flurry of activity and my teeth. Now I'm afraid something much more sinister is going on: Last night, after strapping me into my high chair, Mommy gave me a cupcake -- with frosting -- just like I like it -- but this time she set it on fire. And everybody, Mommy, Daddy, Grandma, Grandpa -- they all sang some sort of song at me. I started crying. I don't think a kid my age can be a heretic. Why, then, are they trying to burn me at the stake? And there's something else, too: Usually, when I crawl around and find a magazine or a book or a newspaper on the floor, I like to open them up and read it. That's what Grandma and Grandpa do with these things; I've seen them. They can turn pages without tearing them, though, and they seem to get upset with me when I tear pages out. I try and quickly eat the evidence so they won't notice, but that only seems to get them more upset. I've gotten picked up and carried out of the room unceremoniously more than once for doing nothing more that that, I can tell you. So... what is going on with these people? And here's the scary part: They let me tear the paper but they kept taking pictures. Are they setting me up for something? We begin this morning's exercise by giving a name to our new pastor. In his case, for reasons that will shortly become apparent, we will have to give him a first and last name. As always, this is not the pastor's actual name. Nobody that appears in these essays is called by his or her actual name. I do this to protect my own anonymity -- and, more importantly, my family's. In this particular case, the need for anonymity takes on a special relevance because my wife teaches in the parish grade school. Her job provides our health insurance benefits; there have been months where hers is the only income we've had. Too many months, lately. So -- while I'm not saying retaliation would be likely were I unmasked -- I live in fear. My last tenuous toehold on the middle class could be lost, at least for awhile, if I make my identity, or the new pastor's identity, too obvious. In providing a name, I have searched the Internet, confirming (as best as I am able) that there is no person named Fr. Timothy X. Warnn. That said, I hereby dub the new pastor, Fr. Timothy X. Warnn. I apologize to anyone named Timothy X. Warnn, living or dead, and assure you that I'm not talking about you personally. Heck, I even apologize to our new pastor. I know I'm not being nice. I much prefer to be nice. But I think I'm being fair. You, dear readers, will not be able to judge whether I am being fair, because you only know my side of the story. You can only decide if you like the stories. Attendance at Saturday's 8:30 a.m. Mass was larger than usual because the school football players were in attendance, along with at least some of their parents. It is a tradition in our parish to have the junior varsity and varsity teams attend Mass on game days, when possible. In the old days (when Oldest Son was playing) this was easy: All the games were on Sunday, and the teams attended 9:00 a.m. Mass, with all the boys in uniform, and the widgets (what we called the JVs then) in their jerseys and pads because their game was played first and they would go directly from church to pregame in the school gym or (if it was a road trip) possibly to the park where the game would be played. The kids all sat together in the front pews, on either side of the center aisle, the widgets on one side and the varsity on the other. Coach Gallagher and all the assistants would be in attendance, too. Over time, this became complicated. Coach Gallagher had children of his own. As each new little one came along (Coach's oldest is a year older than Youngest Son), the logistics got harder and harder and, eventually, the 9:00 a.m. Sunday Game Day tradition had to be scrapped. But it all worked out. Conference alignments changed and games were sometimes played on Saturdays instead of Sundays. One memorable weekend, when we had a Sunday game, we had a special anticipatory Mass on Saturday afternoon in the Monastery next door to the church. It was a very nice, intimate service... until one of the kids, who'd been battling a flu bug but didn't want to tell anyone lest he not be allowed to play, suddenly -- and dramatically -- lost the battle. The real virtue of the kids coming to a regularly scheduled Mass, however, was that the parish could see the boys and feel a tie to the parish school (which the parishioners have so generously supported over the years). It never hurts to renew and reinforce those ties. So it was on Saturday that the teams were in church for the regular 8:30 a.m. daily Mass, sitting down in front (just where, you'd think, the new pastor would want them) with their coaches. Yes, they were wearing their game jerseys. Fr. Timothy X. Warnn, the new pastor, presided at this Mass and, to no one's surprise, he mentioned the boys sitting down front in his Homily. What surprised, and angered, the kids' parents was how he mentioned them. I never liked football, Fr. Warnn told the congregation. It's just one group of thugs beating on another group of thugs. There have been priests before in our parish who were not great football fans. They were easy enough to spot. But they had enough sense to offer a few words of encouragement for sportsmanlike behavior, cooperative teamwork, determined effort -- all the positives that football -- or any organized team sport -- can provide. At the very least they offered a prayer for the safety of the boys and for their opponents. When we heard the story, we asked our informant about any qualifications (as above) that might have been offered by the new pastor. Nope, we were told, none whatsoever. But there was no making peace with the next person we ran across who mentioned Fr. Timothy X. Warnn. She is, shall we say, a lady of a certain age. And she knows her own mind. Sometimes rather forcefully. I think this is characteristic of many women of a certain age. Take my mother-in-law the other day. She was livid that someone had had the temerity to tell her what she should, or should not do (it was in regards to a social matter). "I will not be told what to do," she fulminated. "I'm 80 years old and I can do what I please." And you'd better let her, that's all I can say. Anyway, this other woman of a certain age said she'd come up to Fr. Timothy X. Warnn after Mass to ask him about something or other. But this lady of a certain age called the new pastor "Fr. Tim." The Sun went behind the clouds. The temperature dropped 20 degrees. The pastor actually bristled. "You will call me 'Fr. Warnn,'" he said. The lady of a certain age told us all this and asked if we knew yet of any petition drives to get rid of this new pastor. "I'll sign," she said. Our new pastor may be un-American. He certainly is a control freak. And he may be either arrogant or tone-deaf -- but no one can deny that he is b-r-a-v-e. Deliberately ticking off the ladies of a certain age? The core constituency of any parish ever? He must be brave. Despite my best intentions, I've developed a deep and abiding dislike of our new pastor. When my mother-in-law declared that she couldn't stand the new man, I defended him. Well, that was only his first week on the job. First impressions are hard to undo... but you have to give someone more of a chance than that, especially when it isn't going to be easy to get rid of him. Because I wanted to keep an open mind, and form my own opinions, I wanted to hear the new pastor himself. I wanted to hear him preach; I wanted to take his measure from his own words, not from disgruntled parking lot rumors. But when he was there, I was prepared to listen. The first time was inoffensive. Indeed, although he didn't cite his source, the first Homily I heard the man preach drew heavily on Book VIII of Aristotle's Nicomachean Ethics (on friendship). Ah, I thought to myself, here is an educated man, one who has had some exposure to -- and is influenced by -- the Classics. That, I thought, counted in his favor. But then came last Sunday. I suppose I should have taken notes, but I'm not in the habit of bringing a pen to Mass. And I had no idea, coming in, what I was in for. Sunday's Gospel reading was from Luke, the Parable of the Dishonest Steward. And, again, the pastor started out innocently enough -- and with a take on the tale I'd not considered before: When the shifty steward called in his master's debtors and allowed them to write down their notes (in the hopes that he'd be welcomed in their houses after his pending dismissal), the pastor said, he was probably doing no more than writing off his own commission. Well, I thought, that would explain the master's almost bemused take on discovering his steward's actions on his way out the door ("the master commended that dishonest steward for acting prudently"). I won't pretend to remember exactly how we got from that to the statement that sent me through the roof. But, somehow, he got from this interpretation to this flat statement, "For a Catholic, there is no separation of Church and State." Of course there is -- that is a bedrock principle of the United States of America, one of the things -- and I'd argue it's the single most important thing -- that has kept us from importing the world's religious wars even as we've imported citizens from every corner of our sorry globe. It is one of the things that makes -- and keeps -- America an exceptional nation (sorry, Mr. Putin, but it is so). Now, if you want to say that a person should operate in the public sphere according to the morals and values he has learned from his church, I will agree. A person who pretends to profess one set of values at church and who jettisons them on exiting the parking lot of said house of worship is, at best, a hypocrite. That has always been my problem with the "Born Again" crowd of some other Christian sects -- "accepting Jesus Christ" can't be a free pass to Heaven, especially if one proceeds, despite being "saved," to lie, cheat and steal thereafter. In fact, as I have argued before, it is how we live our lives, not what we preach, and certainly not what our priests and bishops preach, that attracts converts. I listened carefully to see if the pastor would walk that statement back -- as I have just tried to do -- but he did not. A priest who doesn't understand that church and state are separate is an Osama bin Laden wannabe. The late, unlamented Osama and the various "Islamist" sects are also contemptuous of the concept of separation of church and state. Religion (according to their own twisted lights) is the ultimate authority. Persons are not free to act in the public sphere according to their consciences which have been formed by their religious beliefs, but, rather, must act according to the dictates of their religious leaders. That may not be as dangerous as it sounds for most Muslims because Sunni Muslims, the largest sect of that faith, do not have a rigidly structured clerical hierarchy -- although adherents of any number of 'schools' can do (and have done) terrible things, allegedly in the name of their religion, spurred on by the leaders of those 'schools.' But Shiites have imams and ayatollahs that parallel, in many ways, bishops and cardinals in the Roman Church. Thus, with no separation of church and state, the person acting in the public sphere must be guided in all things, not by his conscience, but by the current whim of the Ayatollah -- or of the Cardinal. Or of the pastor? Anyway, careful listening to the new pastor's sermon merely drove up my blood pressure. And it occurred to me: The wholly wrongheaded idea that church and state are not separate, and all the picayune, entirely unnecessary changes he's imposing on the distribution of Communion, or at the Sign of Peace, and the meat cleaver he will shortly take to the Mass schedule (despite the pretense of publicly welcoming 'input') -- it all fits together. This man is an Authoritarian-on-Steroids, drunk on his own Authority. He can either sober up -- or go away -- or watch his large parish become small overnight. Back in March, when we were awaiting the election of a new Pope, I said that it was all rather exciting, but not particularly important. Far more important, in my opinion, was the sort of new pastor we'd get at my home parish in Chicago. We've just become an Archdiocesan parish; the order of priests that served our parish for over a century has abandoned us because of the increasing age and infirmity of its dwindling membership. Although I'm a Curmudgeon, I was not reflexively predisposed to dislike the new man; there would be changes, I knew, but I was ready to welcome the new priest. I wanted him to succeed. I was worried not just about him, but for him, too, when the rumor circulated that he would be the only priest assigned to our large parish, a parish that had been served by three priests until just a few years ago. Then we went to two priests. Last year, with the departure of the religious order imminent, we had our long-time pastor, Fr. Ed, and an octogenarian who volunteered to help out as much as he could. Even so, between them, we had our three weekday Masses almost all the time (four on Holy Days) and six weekend Masses, including an increasingly popular 6:00 p.m. Sunday Mass that brought people in from around the area. Well, the rumor was that the new man would want to cut back on the Mass schedule. And, much as most of the parishioners thought that would be a shame, there was, I think, an understanding that one man alone could not keep up that schedule and do all the other things that the pastor of a modern Catholic parish must do. Then came the good news! We'd get a curate -- a younger man, fresh out of Mundelein, newly ordained. But the new pastor is still looking to cut back the Mass schedule, even though the cumulative age of the new man and his newer assistant probably don't add up to the age of the senior citizen priest who helped Fr. Ed maintain the supposedly 'grueling' schedule this past year. People sit too far apart -- they should gather 'round the altar (but have you ever seen how people 'fill in' seats on buses, trains, anywhere, really, where people gather? -- they leave as much space as possible) -- and, besides, wasn't it the Pharisees who crowded down front, beating their breasts, while the truly devout widow stayed in the shadows? God could see her, too. They should all sing (that sounds suspiciously Lutheran, but I'm willing to let that one slide since my wife likes to sing in church). Now that the new pastor has had his say in the Bulletin our feedback will allegedly be appreciated -- but the word on the street is the new schedule, which is already set, goes into effect on the First Sunday of Advent regardless. We have a big church -- not too big on Christmas or Easter, of course, when the joint is filled to overflowing -- but, according to the new pastor's statistics, there is no normal weekend Mass that even comes close to meeting the 50% "requirement" he has repurposed for his own selfish ends. He can cut the weekend Masses down to one or two -- and he still won't fill the church. Most of the parish (yes, the ones who come out on Christmas and Easter) won't notice anything until Christmas anyway. That's when they'll show up and find the doors locked. Then they won't come back at all. "I hope you're going my way, too." has quite a different approach. The only thing our new pastor is going to accomplish by this wrong-headed scheme is to drive his regular parishioners away. My wife and I are already looking around. But isn't that the exact opposite of what the Church says it wants to do? Pope Francis, God bless him, has likened the Church to a field hospital, treating the spiritually wounded. He gets it; our new pastor doesn't. Do we close hospital ERs because the Chief Resident would like to get a couple hours more sleep on Saturday nights? Fr. Robert Barron, now the Rector of the Archdiocesan seminary at Mundelein, is launching a new video series on evangelization this month. What would Fr. Barron say about our new pastor? Evangelization involves filling empty seats, not cutting back on the opportunities to fill the seats. And how do we fill up the seats? One thing we should do is welcome people -- and provide as many opportunities as we can for that purpose. Frankly, the offering of the Mass, while it is something that only a priest can do, is among the less demanding tasks that a Catholic pastor is called upon to perform. When the new guy sends up clear signals that he is hell-bent (and I use the term advisedly) on messing up the easy part, how can we expect anything but disaster from him on the tough stuff? Our new pastor is a control freak that makes me -- a lawyer, and therefore a control freak myself, by definition -- look tame. I could go on, but I think I've conveyed the gist: Rules, Rules and more Rules! 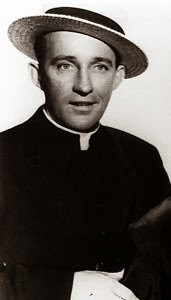 Bing Crosby's fictional Fr. Charles O'Malley asked if we were going his way; our new pastor says 'Go My Way or Hit the Highway.' Compare this attitude to the one conveyed by Fr. Barron in the video below. Which Church would you rather belong to? And it's all the same Church! Readers will have to indulge me for one more post about this new pastor, which I'll hopefully get out of my system tomorrow. I told you that I wanted to give this guy the benefit of the doubt -- so I really wanted to listen to his Homily last Sunday. What he said outraged me, as a Catholic, yes, but also as an American. But that's tomorrow, real world permitting. This video has been out since February 2012 but it strikes me as particularly applicable to the situation in my home parish these days -- a parish in transition, as some readers may recall. I'm working on a post about it -- hopefully even general readers may find it amusing, even if it is quite serious to me. But this nine minute (or so) video by Fr. Robert Barron stakes out the position I'd like to advance. Even as I try to be humorous. Does it make a difference to your opinion on Syria that President Obama is seeking authorization from Congress before acting? I'm still far from enthusiastic about what I'm convinced will be another well-intentioned, ill-fated and ultimately-helpful-to-al-Qaeda misadventure in the Mideast. If I were in Congress I'd be asking the brass hats and policy wonks how any proposed action won't help al-Qaeda as much or more than it hurts the Assad regime. I'd need to be persuaded. I don't know that I could be persuaded on this one. But, for all that, I'm really encouraged that the President is asking.